Birds of India › Blue-winged parakeet › Common cuckoo - Cuculus canorus. The common cuckoo (Cuculus canorus) belongs to the family of cuckoos, Cuculidae. These cuckoo species have an extremely large range, spread over Europe, Asia, Africa and Indian subcontinent. The common cuckoos are brood parasites, laying eggs in the nest of other birds and rely on the host to raise their young. There are four recognized subspecies of the common cuckoo. The common cuckoo (Cuculus canorus) is closely related to African cuckoo (Cuculus gularis), Himalayan cuckoo (Cuculus saturatus) and Madagascan cuckoo (Cuculus rochii). The four recognized subspecies of Cuculus canorus are: Cuculus canorus canorus Linnaeus, 1758, Cuculus canorus bangsi Oberholser, 1919, Cuculus canorus subtelephonus Zarudny, 1914 and Cuculus canorus bakeri E. J. O. Hartert, 1912. The common cuckoo (Cuculus canorus) is a medium-sized cuckoo, measuring 30 to 35 cm in length and weighing 115 grams. The wingspan is 55 to 60 cm. The overall plumage of common cuckoo is slate gray. The adult male has dark slaty gray upperparts. The throat and the upper breast are also slaty gray. The upper breast has a sharp demarcation and the underparts are whitish with dark gray barring. The tail is blackish with brown tinge. The tail has uneven black barring and sparse pale gray spotting. The tail feathers have whitish tips and the upper wing-coverts have whitish edges. There are occasional rufous color morphs occurring among the adult common cuckoo females. In normal females the neck, throat and breast are pale slaty gray. The underpart is whitish and has thin, dark, grayish brown barring. The feet are short and colored yellow. The bill is short and colored gray. The irises, eye ring and the base of the bill are yellow. Their call is a repeated loud "coo coo" sound. These common cuckoo species are widely distributed in Asia, Europe, Africa and Indian subcontinent. The breeding population of the common cuckoo subspecies C. c. canorus is distributed in Europe, West Asia, Middle East, Mediterranean, northern and eastern Asia. These subspecies winter in Africa and southern Asia. The common cuckoo subspecies C. c. bangsi is distributed in Iberian Peninsula, Morocco, Algeria and Tunisia. It winters in Africa, south of Sahara. The subspecies C. c. subtelephonus is distributed in Central Asia and eastern Asia. These subspecies winter in southern Asia and Africa. The common cuckoo subspecies C. c. bakeri is distributed in Himalayan foothills in northern India, Andaman and Nicobar Islands (India), Lakshadweep Islands (India), Nepal, Bhutan, northern Myanmar, northern Thailand, northern Laos, northern Vietnam and southern China. These subspecies winter in Assam, Bangladesh and southeast Asia. 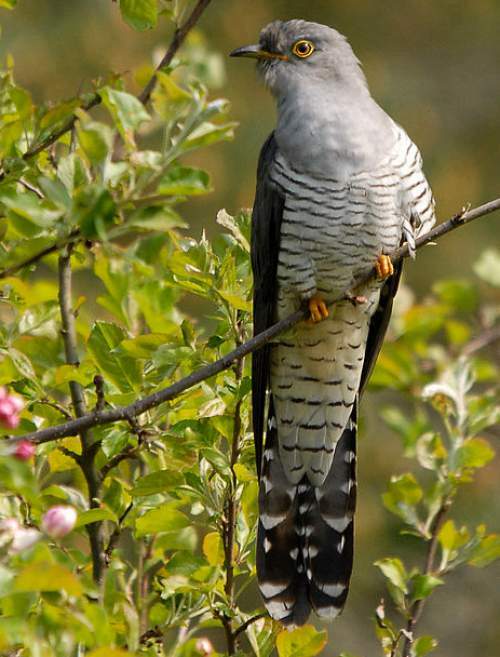 These common cuckoo species have moderate forest dependence. They inhabit subtropical, temperate, evergreen and moist deciduous forest ecosystems. These common cuckoo species inhabit tropical and subtropical evergreen forest, moist deciduous forest, coniferous forest, forest clearances, degraded forest, montane and submontane woodland, secondary-growth forest, temperate and subtropical moist lowland, temperate and subtropical moist shrubland, wooded steppe, heathland, meadows, reedbeds, moorland, farmland, plantations, pasture, rural garden and urban parks. They occur in altitudes from 0 to 3800 meters. The diet of these cuckoo species is mostly hairy caterpillars. Dragonflies, damselflies, moths, mayflies, crickets, grasshoppers, cicadas, butterflies, centipedes and beetles are also their primary food. They are mostly arboreal. They also feed from the ground. The breeding season of these common cuckoo species is during April to July in India and Myanmar. The breading season is from May to July in Europe and is during April and May in Algeria and Morocco. The common cuckoos are brood parasites, laying eggs in the nest of other birds and rely on the host to raise their young. The plumage of these cuckoo species is similar to that of Eurasian sparrowhawk. The male mimics the sparrowhawk and distracts the attention of the host species, giving female time to lay eggs. The female cuckoo normally removes one or two host eggs before laying its egg in the nest. The eggs usually appear similar to host eggs in color and spotting. These common cuckoo species are migratory. The populations in the temperate regions of Europe and Asia migrate to Africa, southern Asia and southeast Asia for wintering. Post breeding, the juveniles may disperse and establish in new locations. They may also make local movements for feeding and breeding in their range. The global population size of the common cuckoo (Cuculus canorus) has been estimated to be about 40,000,000 to 75,000,000 individual birds. The overall population size of these species is considered to be declining. Throughout its range its occurrence is reported to be common. The generation length is 7 years. Their distribution size is about 61,200,000 sq.km. 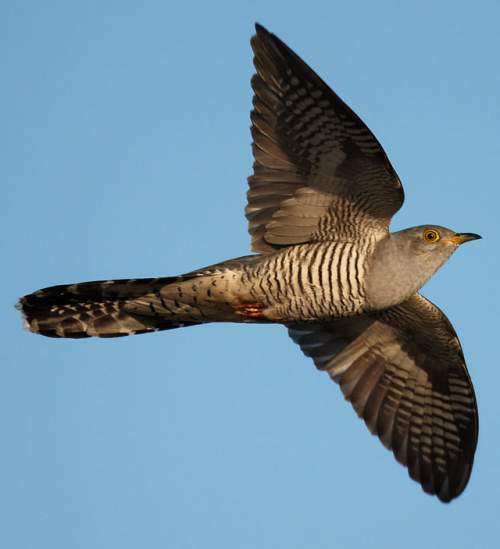 The common cuckoo (Cuculus canorus) does not approach the thresholds for being Vulnerable either under the range size criterion or under the population trend criterion or under the population size criterion. There is sharp decline in their number in the European range. The intensification of agriculture (resulting in fewer insects and nest host species) and indiscriminate use of pesticides are the threats that may endanger the survival of these species. 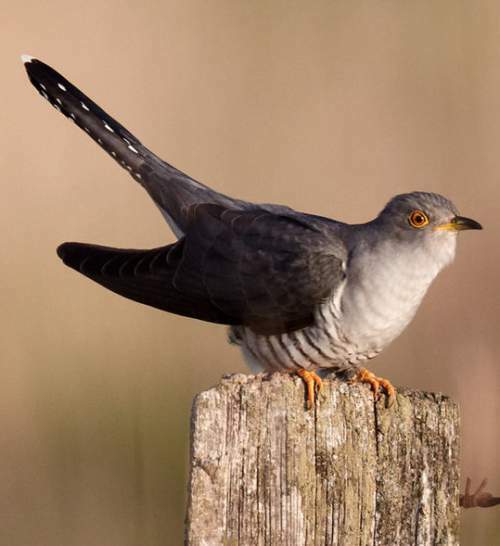 The IUCN (International Union for Conservation of Nature) has categorized and evaluated the cuckoo species and has listed it as of "Least Concern". CITES (the Convention on International Trade in Endangered Species of Wild Fauna and Flora) status is ‘Not Evaluated’ for the common cuckoo (Cuculus canorus). Current topic in Birds of India: Common cuckoo - Cuculus canorus. Birds of India › Speckled wood pigeon › Blue-winged parakeet - Psittacula columboides. The blue-winged parakeet (Psittacula columboides) also known as Malabar parakeet, belongs to the family of parakeets, Psittaculidae. These parakeets species are endemic to India. They occur in the Western Ghats and also the adjoining Eastern Ghats of southern India. The blue-winged parakeet are sexually dimorphic. These parakeets are monotypic species. The blue-winged parakeet (Psittacula columboides) is closely related to Layard's parakeet (Psittacula calthrapae), which is endemic to Sri Lanka. The blue-winged parakeet (Psittacula columboides) is a medium-sized parakeet, measuring 35 to 40 cm in length. The overall plumage of the blue-winged parakeet is bluish gray. The scapular and covert feathers are dark bluish gray. The nape and upper back are pale gray. There is pale greenish tinge around the eye region. Adult parakeets have a black neck collar and males have a bluish green collar below the black collar. The underwing is pale pinkish blue. The undertail is yellow. The tail of blue-winged parakeet is long, bluish with pale yellow tip. The beak is strong and the upper mandible is curved. In males the upper mandible is red with yellowish tip and the lower mandible is grayish black. In females, both the mandibles are grayish black. The irises are black and the feet are gray. Their call is a repeated loud screeching sound. These blue-winged parakeet species are endemic to southwestern India, distributed in the Western Ghats and also the adjoining Eastern Ghats. They occur in the states of Kerala, Tamilnadu, Karnataka, Goa and Maharashtra. Some of the Important Bird and Biodiversity Areas (IBA) of the blue-winged parakeet species in South India are, Amarambalam Reserved Forest - Nilambur, Aralam Wildlife Sanctuary, Anshi National Park, Wynaad Wildlife Sanctuary, Vazhachal Forest Division, Thattekad Wildlife Sanctuary, Talakaveri Wildlife Sanctuary, Periyar Wildlife Sanctuary, Nagarhole National Park, Bhimashankar Wildlife Sanctuary, Kudremukh National Park and Indira Gandhi Wildlife Sanctuary and National Park. These blue-winged parakeet species have moderate forest dependency. They inhabit tropical, subtropical, evergreen and moist deciduous forest ecosystems. These species inhabit tropical and subtropical evergreen forest, moist deciduous forest, degraded forest, secondary-growth forest, tropical and subtropical moist lowland, tropical and subtropical moist shrubland, shola grasslands and forests, farmland and plantations. They occur in altitudes from 0 to 1600 meters. The diet of these blue-winged parakeet species is mostly wild fruits and berries. Apart from fruits, flowers, buds, tender shoots, leaves, seeds of wild plants and grass, grains, cereals, nuts and nectar are their primary food. They are mostly arboreal. They also feed from the ground. The breeding season of these blue-winged parakeet species is during December and March in Western Ghats in India. They nest in high tree holes, usually more than 6 meters from the ground. They also make use of abandoned woodpecker and barbet nests. The clutch contains up to 4 eggs. Both the parents incubate the eggs. The eggs hatch in about 23 days and the juveniles fledge after 30 days. These blue-winged parakeet species are non-migratory, stationary, resident birds. Post breeding, the juveniles may disperse and establish in new locations within the range. They may make local movements for feeding and breeding in their range. Sometimes they become nomadic when dearth of food occurs. The global population size of the blue-winged parakeet (Psittacula columboides) has not been quantified. The overall population size of these species is considered to be stable. Throughout its range it is reported to be common. The generation length is 7.5 years. Their distribution size is about 276,000 sq.km. The blue-winged parakeet (Psittacula columboides) does not approach the thresholds for being Vulnerable either under the range size criterion or under the population trend criterion or under the population size criterion. There are no substantial threats that may endanger the survival of these species. Its chicks are sometimes illegally trapped for pet trade. The IUCN (International Union for Conservation of Nature) has categorized and evaluated the parakeet species and has listed it as of "Least Concern". 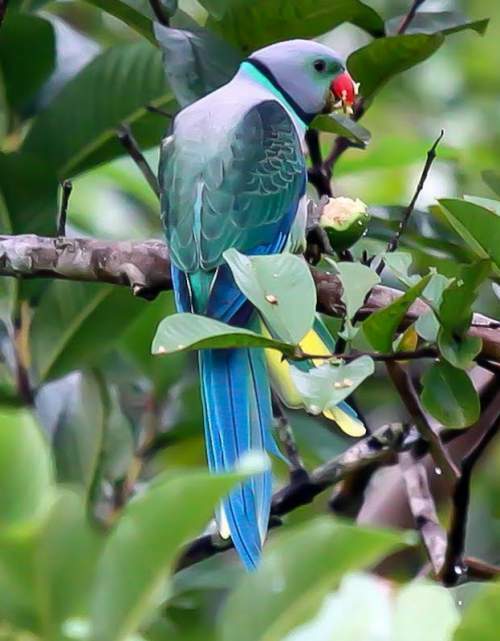 CITES (the Convention on International Trade in Endangered Species of Wild Fauna and Flora) status is ‘Not Evaluated’ for the blue-winged parakeet (Psittacula columboides). Current topic in Birds of India: Blue-winged parakeet - Psittacula columboides. Birds of India › Chestnut-bellied sandgrouse › Speckled wood pigeon - Columba hodgsonii. The speckled wood pigeon (Columba hodgsonii) belongs to the family of doves and pigeons, Columbidae. 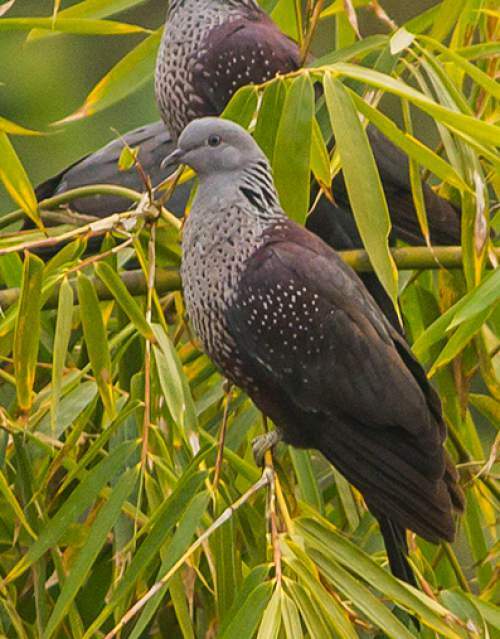 These wood pigeon species are distributed in India, Pakistan, Nepal, Bhutan, China, Myanmar, Thailand, Laos and Vietnam. These pigeon species occur in altitudes from 1800 to 4000 meters. Throughout their range they are reported to be uncommon. The speckled wood pigeon is a monotypic species. The speckled wood pigeon (Columba hodgsonii) is closely related to C. arquatrix, C. sjostedti, C. thomensis and C. pollenii. The speckled wood pigeon (Columba hodgsonii) is a medium-sized pigeon, measuring 35 to 40 cm in length. The overall plumage of the speckled wood pigeon is grayish maroon. The head is small and pale gray in color. The throat is silvery gray. The breast and the sides of the neck are pinkish silver with blackish speckles. The nape is silvery with dark striations. The belly and the shoulder region are grayish maroon with speckles. The irises are black with gray bare eye circle. The bill and the feet are gray. The pigeon call is a faint "oo-oo-oo" sound. These speckled wood pigeon species are distributed in India, Pakistan, Nepal, Bhutan, China, Myanmar, Thailand, Laos and Vietnam. In India, they are distributed in the states of Jammu and Kashmir, Himachal Pradesh, Uttarakhand, northern West Bengal, Sikkim, Arunachal Pradesh, Assam, Nagaland and Manipur. In China, these species occur in the provinces, Gansu, Ningxia, Sichuan, Yunnan, Guizho and Shaanxi. The Important Bird and Biodiversity Areas (IBA) of the speckled wood pigeon species in Nepal are Annapurna Conservation Area, Tamur valley and watershed, Dhorpatan Hunting Reserve, Shivapuri-Nagarjun National Park, Kanchenjunga Conservation Area, Shey-Phoksundo National Park, Khaptad National Park, Makalu Barun National Park, Langtang National Park and Mai Valley forests. These speckled wood pigeon species have moderate forest dependence. They inhabit temperate, montane ecosystems. These species inhabit temperate forests, subtropical montane shrublands, tropical submontane forests, tall evergreen hill forests, semi-evergreen oak forests and foothill forests. They occur in altitudes from 1800 to 4000 meters. The diet of these speckled wood pigeon species is mostly wild fruits and berries. Apart from fruits, seeds of wild plants and grass, grains, cereals, shoots and buds are their primary food. They are mostly arboreal. They also feed from the ground. The breeding season of these speckled wood pigeon species is during May and June in northern India. The nest is a made of sticks and leaves on the fork of trees. and the clutch contains two or three eggs. Both the parents incubate the eggs. They also use tree holes and rock crevices to nest. These speckled wood pigeon species are partially migratory, undertaking local and altitudinal movements in winter. They move to lower altitudes to avoid snow. Post breeding dispersal of the juveniles takes place. They may make local movements for feeding and breeding in their range. The global population size of the speckled wood pigeon (Columba hodgsonii) has not been quantified. The overall population size of these species is considered to be stable. Throughout its range it is reported to be uncommon. The generation length is 5.6 years. The speckled wood pigeon (Columba hodgsonii) does not approach the thresholds for being Vulnerable either under the range size criterion or under the population trend criterion or under the population size criterion. There are no substantial threats that may endanger the survival of these species. 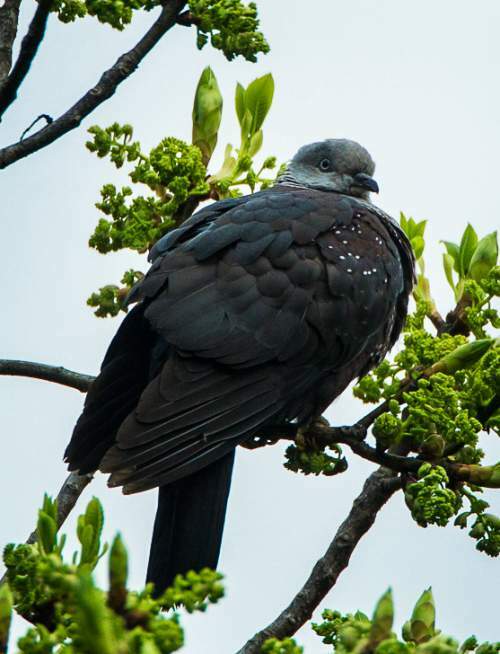 The IUCN (International Union for Conservation of Nature) has categorized and evaluated the pigeon species and has listed it as of "Least Concern". CITES (the Convention on International Trade in Endangered Species of Wild Fauna and Flora) status is ‘Not Evaluated’ for the speckled wood pigeon (Columba hodgsonii). Current topic in Birds of India: Speckled wood pigeon - Columba hodgsonii. Birds of India › Pomarine jaeger › Chestnut-bellied sandgrouse - Pterocles exustus. The chestnut-bellied sandgrouse (Pterocles exustus) belongs to the family of sandgrouses, Pteroclididae. These sandgrouse species are distributed in India, Pakistan, Iran, United Arab Emirates, Yemen, Omen, Saudi Arabia and Central African countries. In Africa, the chestnut-bellied sandgrouse is abundant in the Sahel region. There are six recognized subspecies of the chestnut-bellied sandgrouse. The chestnut-bellied sandgrouse (Pterocles exustus) is closely related to the Pterocles namaqua, Pterocles orientalis, Pterocles gutturalis, Pterocles personatus, Pterocles coronatus, Pterocles alchata and Pterocles burchelli. The six recognized subspecies of the chestnut-bellied sandgrouse are: P. e. exustus Temminck, 1825, P. e. floweri Nicoll, 1921, P. e. ellioti Bogdanov, 1881, P. e. olivascens (E. J. O. Hartert, 1909), P. e. erlangeri (Neumann, 1909) and P. e. hindustan R. Meinertzhagen, 1923. The chestnut-bellied sandgrouse (Pterocles exustus) is a relatively small sandgrouse, measuring 45 to 50 cm in length. 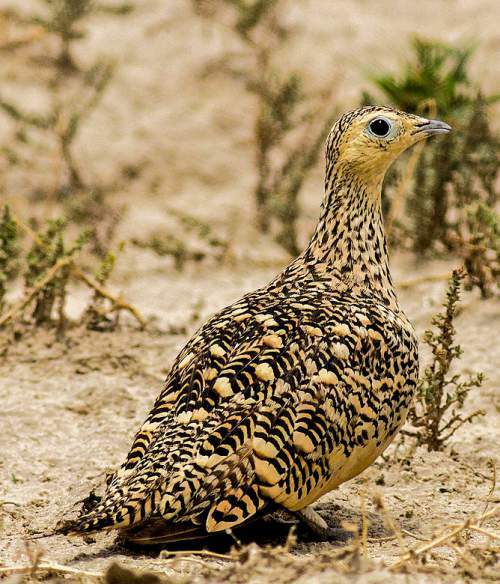 The male sandgrouse is slightly larger and weighs 170 to 300 grams whereas the female weighs 140 to 240 grams. The overall plumage is light reddish brown, providing the bird with wonderful camouflage against the arid dry environment. The head and neck have an orange tinge. The underwings are dark brown. The belly region is reddish brown. The sandgrouse irises are black and the bare skin around the eyes is light green. The bill is small, slightly curved and pale gray in color. The legs are short and gray in color. The female has dark mottles and striations over the body as well as the wings. The chestnut-bellied sandgrouse call is a noisy repeated "crok crok" sound. These sandgrouse species are distributed in Gambia, Senegal, Mauritania, Mali, Gambia, Guinea-Bissau, Burkina Faso, Togo, Niger, Nigeria, Cameroon, Chad, Central African Republic, Sudan, South Sudan, Tanzania, Kenya, Somalia, Ethiopia, Eritrea, Egypt, Saudi Arabia, Yemen, Omen, United Arab Emirates, Iran, Pakistan and India. In Africa, the chestnut-bellied sandgrouse is abundant in the Sahel region, the ecoclimatic and biogeographic zone stretching across the south-central latitudes of Northern Africa between the Atlantic Ocean and the Red Sea. Vagrant birds are seen in Hungary, Israel, Jordan and Kuwait. Introduced populations exist in United States. The chestnut-bellied sandgrouse subspecies P. e. exustus is distributed in Mauritania, Gambia and Sudan. The subspecies P. e. floweri was considered extinct in 1979 and was recently rediscovered in Minya Province in Egypt. The subspecies P. e. ellioti is distributed in Sudan, Eritrea, Ethiopia and Somalia. 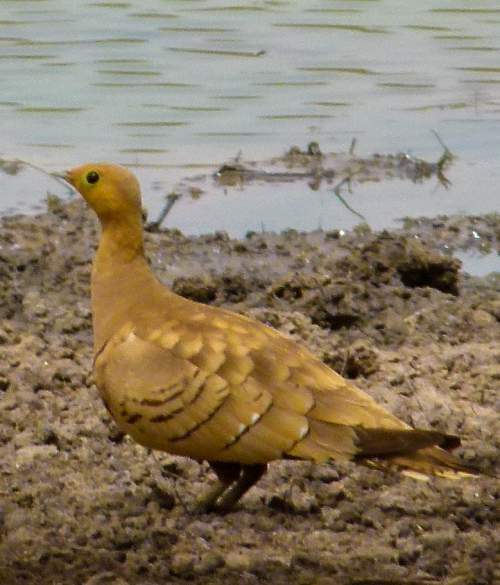 The chestnut-bellied sandgrouse subspecies P. e. olivascens is distributed in South Sudan, Ethiopia, Kenya and Tanzania. The subspecies P. e. erlangeri is distributed in Arabian Peninsula. The subspecies P. e. hindustan is distributed in Iran, Pakistan and most of India. These chestnut-bellied sandgrouse species do not normally occur in forests. They inhabit various natural, open, dry, sparsely bushy ecosystems. 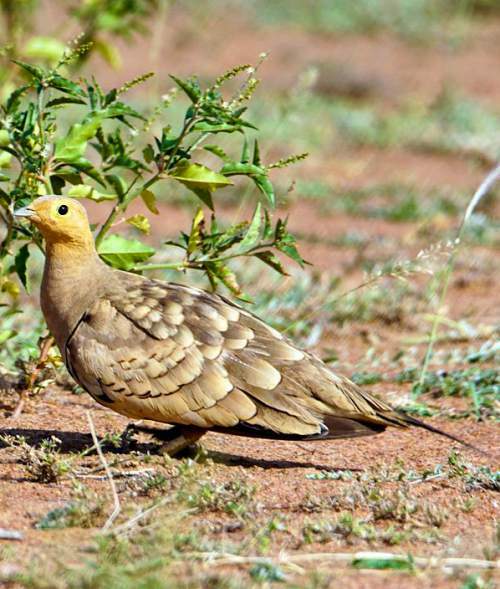 The sandgrouse species inhabit tropical and subtropical dry grasslands, tropical and subtropical shrublands, semi-desert, hot desert, dry steppe and dry fallow agricultural fields. They occur in altitudes from 0 to 1500 meters. The diet of these chestnut-bellied sandgrouse species is mostly wild seed. Seeds of wild legumes are the primary food. They may also feed on other seeds, grains and cereals. They fly up to 80 kilometers in a day in search of watering holes. The breeding season of these chestnut-bellied sandgrouse species varies with their location in the range. The breeding season is from March to May in northern India. In southern India, the breeding season is from January to April. The nest is a ground scrape and the clutch contains two or three eggs. Both the parents incubate the eggs. The hatchlings soon after hatching follow the parents in their forage trip. These sandgrouse species are non-migratory, sedentary and resident birds. Post breeding dispersal of the juveniles takes place. They may make local movements for feeding and breeding in their range. The global population size of the chestnut-bellied sandgrouse (Pterocles exustus) has not been quantified. The overall population size of these species is considered to be stable. Throughout its range chestnut-bellied sandgrouse is reported to be common and widespread. In Sahel region of Africa, they are abundant. The generation length is 5.6 years. The chestnut-bellied sandgrouse (Pterocles exustus) does not approach the thresholds for being Vulnerable either under the range size criterion or under the population trend criterion or under the population size criterion. There are no substantial threats that may endanger the survival of these species. The IUCN (International Union for Conservation of Nature) has categorized and evaluated the sandgrouse species and has listed it as of "Least Concern". CITES (the Convention on International Trade in Endangered Species of Wild Fauna and Flora) status is ‘Not Evaluated’ for the chestnut-bellied sandgrouse (Pterocles exustus). Current topic in Birds of India: Chestnut-bellied sandgrouse - Pterocles exustus. Birds of India › Indian skimmer › Pomarine jaeger - Stercorarius pomarinus. The pomarine jaeger (Stercorarius pomarinus) belongs to the family of jaegers and skuas, Stercorariidae. These jaeger species are highly migrant and breed in the far north of Europe, Asia and North America. 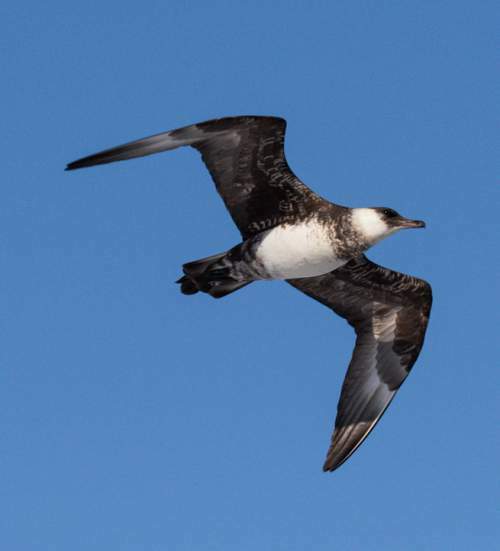 The wintering population of pomarine jaeger species is distributed in the tropical and subtropical coasts of all major oceans. The breeding population is specialized in catching lemmings, which are the main diet of breeding jaeger. The pomarine jaeger is a monotypic species. The pomarine jaeger (Stercorarius pomarinus) is closely related to the great skua (Stercorarius skua). The pomarine jaeger (Stercorarius pomarinus) is a large-sized bird, measuring 45 to 50 cm in length and weighing 550 to 900 grams. The jaeger wingspan is 120 to 140 cm and the wing is long and broad. The overall plumage is grayish brown. There are three morphs. The light-morphs have brown back with white under parts. The dark morphs have dark brown plumage and the intermediate morphs have dark backs with somewhat paler underparts. All these jaeger morphs have a white patch in the underwing, which flashes during flight. In breeding adults, there are two central tail feathers streamers, which are long and spoon-shaped. The irises are black. The pomarine jaeger call is a chattering noise and also "which-yew" sound. The breeding pomarine jaegers occur in far north Arctic tundras in Europe, Asia and North America. They undertake transequatorial over land migration and move to tropical and subtropical coasts, especially of Australia and Argentina. 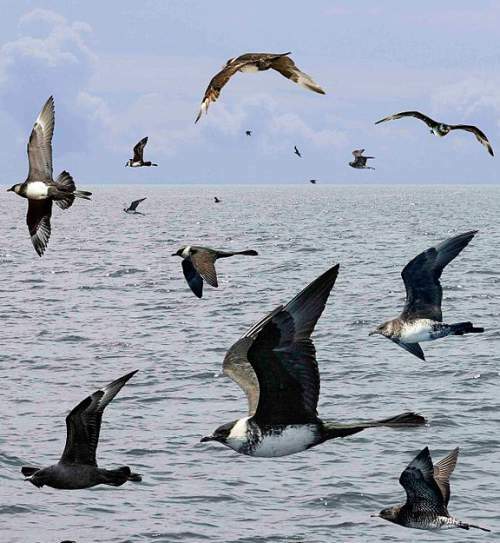 The pomarine jaegers also occur in coasts of countries bordering Indian Ocean, Arabian Sea, South Pacific Ocean, South Atlantic Ocean, southern part of North Atlantic Ocean, southern part of North Pacific Ocean and South China Sea. The Important Bird and Biodiversity Areas (IBA) of pomarine jaeger species in United States are Barrow Canyon & Smith Bay, Beaufort Sea Shelf Edge 152W71N, Bering Sea Shelf 168W62N, Bering Sea Shelf 169W60N, Chukchi Sea Nearshore, Eastern Kodiak Island Marine and Icy Cape Marine. 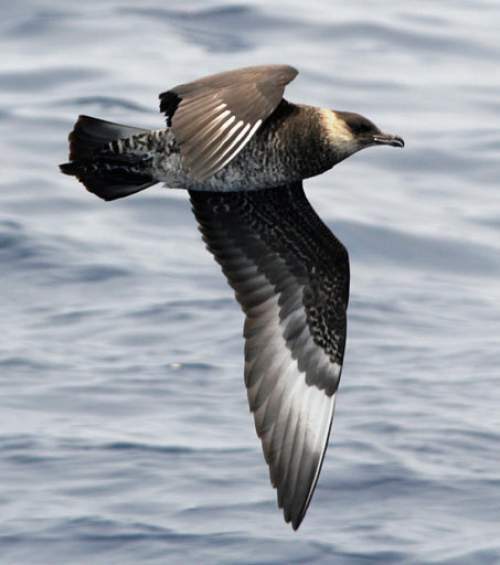 The IBAs of pomarine jaeger in Norway are Slettnes and Varanger Peninsula. The IBA in Russia is the Valley of the Yorkutayakha river. These jaeger species do not normally occur in forests. They inhabit various natural, open, wetland, Arctic and tundra ecosystems. The pomarine jaeger inhabit tundra grassland, shallow seas with macroalgae, seagrass or kelp, coastal upwelling regions, neritic subtidal areas with loose pebble, gravel, sand or mud and tundra wetlands. Outside the breeding season, the diet of these pomarine jaeger species is mostly fish. Lemmings are the primary food of the breeders. The jaeger is a specialist lemming hunter, in many instances digging open the burrows. The wintering birds feed on fish, carrion, fish scraps, smaller birds and rodents. Sometime the pomarine jaegers are kleptoparasitic, robbing gulls, terns and gannets of their catches. The breeding season of these jaeger species starts from June in the Arctic tundras. Breeding sites are widely scattered over tundra. The pomarine jaeger nest is a scrape on the ground, rarely lined with grass. The clutch may consist of two or three olive-brown eggs. The jaegers are highly territorial and fly at the head of any intruder approaching their nest. The parents incubate and the eggs hatch in about 25 days. These jaeger species are highly migratory and the breeding populations from northern Europe, Asia and North America move to tropical and subtropical coasts for wintering. After the transequatorial migration, much of the population is distributed along the coastlines of Australia and Argentina. These jaeger species also migrate over land and disperse along the coasts of countries bordering Indian Ocean, Atlantic Ocean and Arabian Sea. Post breeding dispersal of the juveniles takes place. They may make local movements for feeding and breeding in their range. The global population size of the pomarine jaeger (Stercorarius pomarinus) is estimated to be about 400,000 individual birds. The overall population size of these jaeger species is considered to be stable. Throughout its ranges it is reported to be common to uncommon. The generation length is 13.5 years. The pomarine jaeger (Stercorarius pomarinus) does not approach the thresholds for being Vulnerable either under the range size criterion or under the population trend criterion or under the population size criterion. There are no substantial threats that may endanger the survival of these species. Climate change, severe weather and habitat shifting and alteration may affect the survival, especially of the hatchlings and fledglings. The IUCN (International Union for Conservation of Nature) has categorized and evaluated the pomarine jaeger species and has listed it as of "Least Concern". CITES (the Convention on International Trade in Endangered Species of Wild Fauna and Flora) status is ‘Not Evaluated’ for the pomarine jaeger (Stercorarius pomarinus). Current topic in Birds of India: Pomarine jaeger - Stercorarius pomarinus.